Blue infrastructure should be wrapped up under the banner of green infrastructure – not separated. 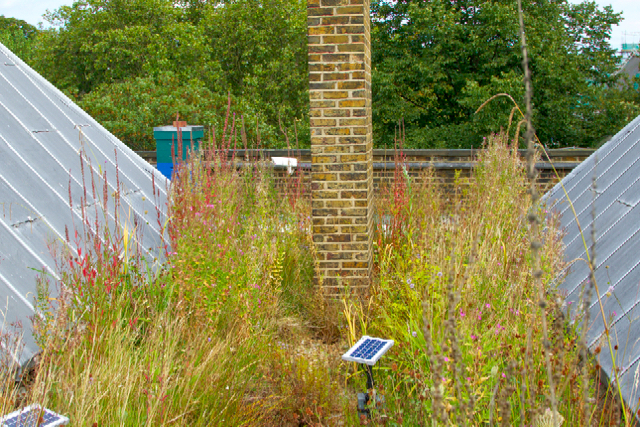 A blue-green roof can deliver multiple benefits to the urban environment. Blue infrastructure and blue/green infrastructure appears to be the new game in town. But why is this so when we already have green infrastructure? Is it all just marketing spin or is it primarily because there is a need for a new trendy term to attract interest? Let’s first take a look at the terms – if you google blue infrastructure it is very hard to come up with a single source that talks about this term. In fact most of leading sites refer to blue/green infrastructure. They are married not divorced. So is there a difference? Only a few sites I researched came up with some differentiation. Blue would appear to be the blur between grey and green.Whilst green would be the preferable way forward, some urban sites maybe too constrained to take a green version. This is where blue fits the bill. It is an intermediary approach that stores water but adds no other sustainable value. Blue slows and stores water whilst doing little else. Green, in terms of water, acts the same whilst providing a fuller range of benefits. The way blue is described as an intermediary approach unfortunately fits and appeals to a more conventional approach to designing for water. Although most of the positive sites state categorically that green is preferred, blue is all pipes and valves and pumps. There is no soil and vegetation to be seen anywhere. Furthermore, this idea will also lead to assumptions about where green infrastructure can’t be used. I have had the experience of many ‘experts’ openly questioning whether green can be used in dense urban areas. There is an assumption or a damn right lack of will to even consider the green as an option. Blue infrastructure? What’s this got to do with green roofs? Having spent the last 20 years ensuring that green roofs are a mainstream covering, I am often asked if blue roofs are a threat. But when you look at what a blue roof is and what a green roof is you will be left with a question? What is the difference? In my opinion, there is no difference. In fact, once googled, you will find most of the blue roofs advertised are in fact green roofs. Is this then just all about new fade? I suspect that there is something else going on here. Architects and developers have been unwillingly dragged to the altar of green roofs. 90% of the architects would prefer never to use a green roof. They are only ever designed when they are made to it by planners. With an increasing pressure designing in elements that store water and reduce run off rates blue roof fits a mind set. Why use a green roof whey you can use a blue roof? Dispense with the green and grab the blue – essentially plastic boxes that store water. However, there are very good reasons, not to store water directly on a membrane. Storing the water within the green roof element is a much better idea. The green roof element protects the water proofing and delivers exactly what a plastic blue roof version is purported to do. 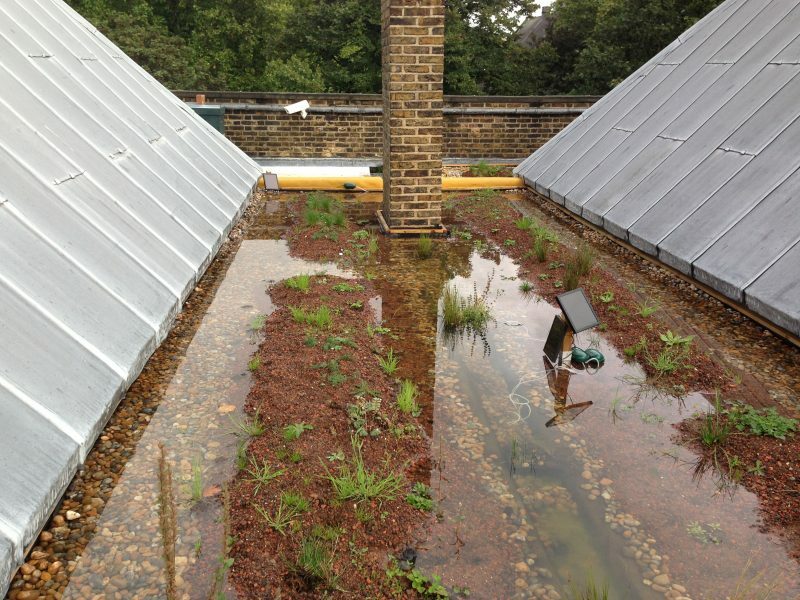 Is this wetland roof blue infrastructure or green infrastructure? It is both? Small in size though it maybe, a wetland green roof on the Victoria and Albert would probably be considered a biodiverse green roof. It’s design, however, was an initially to be the start of a rain water recycling concept. Rain would collect in the wetland roof taken from the adjacent pitched roofs. Here it would be cleaned to be passed onto to be used in toilet flushing. This part of the story has yet to be achieved. However, it is storing large amounts of rain water. It truly is a source control mechanism in the Sustainable Urban Drainage management train (SUDS). As important it is a mini-habitat amongst the vast grey roofscape of the museum. This is, surely, blue and green in action without any plastic boxes within the system. Possman Cider Factory – google maps screen grab. 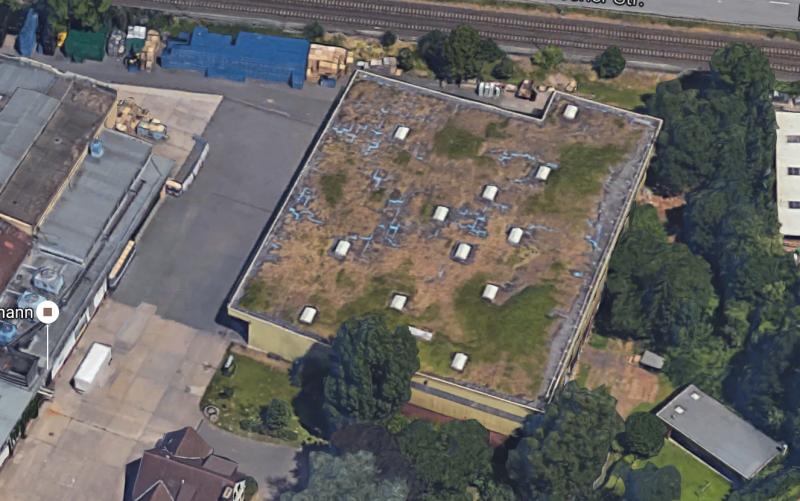 The Possman Cider Cooling and Storage Facility in Frankfurt, Germany yielded a 2-3 year payback for their green roof system through savings in heating and cooling costs, as well as in equipment costs, since additional cooling towers had become unnecessary. So this wetland green roof is a dynamic example of green infrastructure in practice. Saving money, reducing energy, cleaning water and creating a mini-habitat. What’s the next colour infrastructure? You bet there is already a new term being banded around which I am sure the originators would like to supersede green and blue – Turquoise infrastructure!!!!! Of course if you are colour fixated this works fine, a perfect blend of green and blue. The thing is, it’s a new term. What the proponents of this latest colour alchemy are suggesting they have found the third way. The have taken the crucible and formed a new and innovative approach – there’s is the enlightened way to take infrastructure forward to the 22nd Century . And where there is turquoise infrastructure, if it catches on, there will be turquoise roofs!!!!! But if you take of your turquoise tinted glasses off, it is just green infrastructure. So forget the marketers, branders and wordsmiths arguing over the colour of the infrastructure. Like the Possman Cider Factory or the Victoria and Albert wetland roof, lets just get on with delivering green infrastructure and green roofs.